How to create a business card in Microsoft Outlook? MS Outlook is a popular email management tool. You can create and attach a business card along with the emails sending through Outlook. 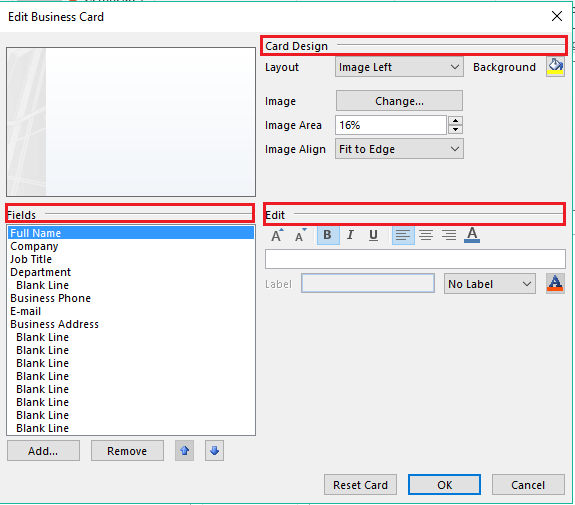 The process of creating a new business card in MS Outlook 2016 is also quite easy and short. You can choose the desired card layout, images, contact fields, and graphics as per your needs. In MS Outlook, go to the Home tab. In the New Items group, select the Contact option. To create a business card, click the Business Card box. In the Edit Business card box, under Card Design, provide the details like layout, image, image area (in percentage), and image align information. A particular color can be selected using the Background option. To add an image and logo, just select image option to select images, size it and position as per your convenience. To add and remove different stuff, you can use the Fields option. If you want to remove an item, then go to Fields, and click Remove. Positioning the text on the card is also quite easy: click any field under the Fields option, and by using the UP and DOWN arrows on the keyboard, place the field anywhere you want it. The business card can be shared with others using the email messages. 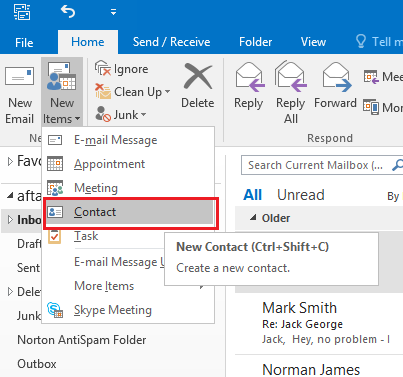 If the user is using MS Outlook 2016, 2013, 2010, and 2007, then the business card will appear exactly as the sender has sent it. Receiver can right-click the business card and save it to his Outlook contacts. With versions earlier than Outlook 2007, the user will see the business card as an image. But a .vcf file is attached with the business card. The .vcf file can be opened and information will be saved in the contact list. In can be forwarded multiple times. Only the email address is needed to send the business card. Changes can be performed in seconds. It is accessible from the email. Recipient does not need any app to open the business card.